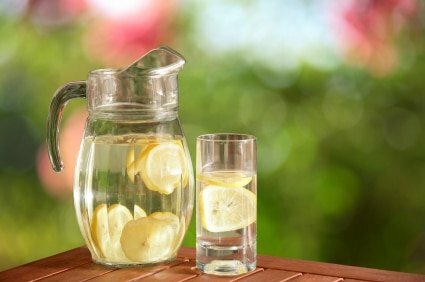 Find out how lemon water can give your skin a boost this year. There have been ups, downs, and surprises that have given me joy, sadness and the ability to grow. I guess that's like every year – what's the point of being alive if you don't feel all your emotions and push yourself to learn and experience new things? One of the most joyful experiences for me this year was moving to Berkeley with my husband Kevin and our cat Jonny 5 in March. It was nice to settle down after traveling in an RV for over 2 years and find a place that had all the things we needed to live happy and healthy – which include great weather, everything in walking distance, great food, fantastic farmers markets, and easy access to one of my favorite cities in the world, San Francisco. For Annmarie Gianni Skin Care, the most joyous experience has been getting more and more testimonials from people just like you who've used the products and have been getting fantastic results! But enough about me! What has been your most treasured moment of 2011? Be sure to leave a comment on the blog if you feel inclined to share. Today, I wanted to share a few things with you to help you get focused on your beauty in 2012. I'm predicting that this year will be the year that people finally start to realize that natural skin care works just as well as – and in many cases better than – the synthetic and chemical products on the market. The second thing I wanted to share is that for the next 3 days – until 11:59 PM on January 1st, 2012 – we're going to have a special “Hello Beautiful 2012” sale. You can get 12% off (to match 2012) anything in the Annmarie store. My challenge to you this year is to try these products for 2 weeks and give them a chance. I guarantee that you'll notice a difference – and in just two short weeks, you'll have transitioned into the new year with renewed confidence and a youthful glow. 1. Start your day with 16 oz of clean water and squeeze a lemon wedge in it. This will help your body alkalize and hydrate first thing in the morning. 2. Get a good night sleep, making sure there are no unnecessary distractions. Sleep with ear plugs if your environment is noisy and sleep with an eye mask if your environment is not pitch black. 3. Avoid caffeine and alcohol, these can put a strain on your adrenals which will leave you looking tired with bags and dark lines under your eyes. 4. Avoid packaged foods, like crackers, chips, and cookies. These will dehydrate you and strain your adrenals which will steal away your natural glow. 6. Go a week or two without dairy products (milk, cheese, even yogurt) and see what happens, dairy can cause unwanted acne, mucus and bloating. 7. Eat lots of antioxidant rich foods like blueberries, cherries, goji berries and raspberries. Antioxidants are our natural protection from the sun! 8. Take a digestive enzyme to make sure you're getting the most nutrition from your food and to help avoid irritation in the gut which can lead to unhealthy looking skin. 9. Eat lots of watery rich foods, like raw fruits and veggies. This will keep you hydrated, keep your skin tight and build your collagen. 10. Exercise! Sweating is a great way to keep your skin detoxified and unclog pores. People who exercise regularly always look younger – as long as they don't over do it. If you incorporate at least 3-4 of these tips and use my products for your daily beauty routine, you may just end 2012 looking younger than you did in 2011! And again because we care so much about you, we are offering a 12% off “Hello Beautiful 2012” sale to help you get started on your 2012 beauty routine. P.P.S. This deal expires on January 1st, 2012 at 11:59 PM PST. Not to be combined with any other offer.